The magnetic permeability calculator is a tool that will help you determine the dependency between magnetic permeability and susceptibility. In the following text, we have explained what is permeability and presented how you can calculate it using the permeability definition. Read on if you want to find out why some materials are magnetic and some are not. Did you know that there are substances, called superconductors, which have an unusual property that allows them to levitate in a magnetic field? Isn't it fascinating? That's why we have also answered the question of what is a superconductor. in diamagnetic materials an externally applied magnetic field creates an internal magnetic field with opposite direction, causing a repulsive effect. Their magnetic permeability is less than the magnetic permeability of free space µ₀. paramagnetic materials have the magnetic permeability greater than µ₀, but its internal magnetic field arises only in the presence of an external magnetic field. The magnetic field attracts them. ferromagnetic materials have magnetic permeability much greater than µ₀, and they can retain their internal magnetic field even in the absence of an external magnetic field. Ferromagnetism is the mechanism that forms permanent magnets in specific materials, e.g., one of the strongest - a neodymium magnet. Do you know what is the microscopic origin of the magnetism of matter? Check our magnetic moment calculator to learn how you can compute an elementary magnetic moment of an atom. magnetic field B which is the total magnetic field inside the material. B = µ₀ * (H + M), where µ₀ = 4 * π * 10^(-7) H/m is the magnetic permeability of free space. The unit H is called "henry" and it is an unit of inductance (check solenoid inductance calculator). We usually use so-called relative permeability µᵣ = µ / µ₀ to simplify the notation. 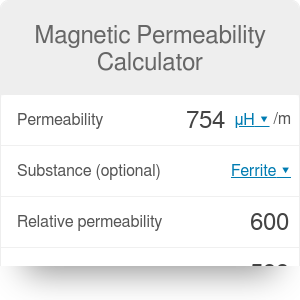 Try our magnetic permeability calculator and see how it works! Physical properties of some materials sharply change when cooled below a characteristic critical temperature. Their electrical resistance and permeability become exactly zero, and therefore they are called superconductors. A material with zero permeability behaves like an ideal diamagnetic which completely ejects a magnetic field from the interior of superconductor, and we can observe the levitation phenomenon. Perhaps the dreams of levitating cars will soon come true? Magnetic Permeability Calculator can be embedded on your website to enrich the content you wrote and make it easier for your visitors to understand your message.